The great divide between people who plan logically and those that just plug in dates just got a whole lot wider with the release of MS Project 2010. The cause—Manually Scheduled task mode which, by the way, is the default. The idea was good in theory: top down planning, build in uncertainty, all that sort of stuff. The reality is a mess, with users encouraged to ‘type in the answer’, for example type in the dates they want. People using Excel to add up numbers wouldn’t independently work out the totals and type them in would they? Maybe they would? Personally I’d use a formula. Makes about as much sense as typing in the answer into MS Project, completely overriding the tool’s ability to calculate dates. Personally I’d use the Critical Path Method engine to calculate dates. 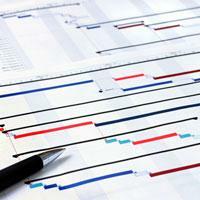 Planning, as apposed to scheduling, typically follows a clear and repeatable process. This assumes of course that the plan is based on fixed scope/quality expectations with cost/effort/time the variables. We call this approach the ‘jigsaw model’. Determine the scope of the project (the what and the why), usually via a work breakdown structure (WBS). Agree responsibilities for each major WBS element. Define and agree the dependencies between the WBS elements. This step should be the focus of planning and project management. For each major WBS element (jigsaw piece), work with the responsible manager to determine the how, when and who. This would be represented via a traditional scheduling techniques for each WBS element: summaries, tasks/activities, milestones, durations, predecessors, resources etc. Add the other schedule data such as start date, status date, calendar then join the jigsaw pieces together via the dependencies. Refine, clean up then start the review process. Your aim is to gain agreement and baseline it. Dependencies in this context is about how one WBS element and/or project relates to another. This is a subtly different concept to the predecessor relationship between two tasks. Logical planning in this context refers to the representation of task timing, bearing in mind the major dependencies and relationship to other tasks. Dates, along with float, are calculated as a result. One then compares those calculated dates with the required dates and manages variance accordingly. So fight the urge, turn off the Manually Scheduled mode and learn how to use the tools properly. Build a meaningful, logical schedule to have confidence you can achieve your dates. Martin Vaughan started his career as a specialist planner/scheduler in construction before moving to defence, then into IT. He progressed through project management and program management into consulting and advisory roles. Meanwhile he maintained an interest in tools and technology, on the way building and managing small businesses and squeezing in some lecturing in IT Project Management at the University of Melbourne. He is now a director and senior consultant at Core Consulting Group. Martin Vaughan has written 13 articles for us.